When my husband and I got married, ten (TEN) years ago next June, my something old was a necklace of my grandma’s, my something new was my wedding dress, my something borrowed was a tiara from my sister-in-law-to-be, and my something blue was my garter. Fun fact! The garter was Cinderella-themed. I really like Disney. Moving along. The best weddings I’ve ever been to have been a beautiful combination of old and new (and possibly borrowed and blue, though this depends slightly on your budget and color scheme). Traditions exist for a reason – bright flowers, heartfelt vows, a giant cake – none of these are required to have a wedding, but if you walk into a church draped in white and candles and petals, you think – aha! Here Comes the Bride. Of course, a wedding is still a wedding if it happens in a court house, on a beach, in a church, or in your favorite theme park located in central Florida. That’s the beauty of it! Old or new, two people in love make a vow and agree to start a life together. I’ve heard a lot of debate in the case of old vs. new, but I don’t think you can easily pick a side. If you really believe the world was so much better “back when you were a kid,” that’s a grim outlook for children (who, as Whitney Houston reminds us in “The Greatest Love of All,” are our future). Alternatively, if you think there is nothing to learn from those who came before you, I’d like to direct you to a little adage about being doomed to repeat that which you do not learn from. So, unsurprisingly, my food philosophy has roots in the past and the present. As I have mentioned, I love local foods. Our meat and produce – especially spring/summer/fall produce – are largely purchased from shops and markets in town, raised and grown by people in my community. I like to buy foods that are relatively unprocessed, with simple, clean ingredients, and no artificial colors or flavors. That sounds lofty and wonderful, yes? It’s true – I do love these things. I strive to buy foods like that, to can and freeze and live off the very nearby land as much as possible. My four year old wants to go to a u-pick banana farm so badly. Me too, buddy. It’ll cost a bit to get to one. In today’s world, I can eat avocados and bananas even though I live in the great white north. I can wait for these fruits to be picked, shipped, priced, and sitting in a crate at my local grocery store. I love that! I mean, I’d also love to go pick bananas somewhere tropical; husband, take note. But for everyday purposes, show me the banana. Thanks, brave new world! I think the most important thing about your food philosophy is that it is yours. Don’t let yourself feel badly if you aren’t strictly paleo or vegan or grapefuit diet. Allow yourself to make the choices that work the best for you and your family. Have the means to raise your own chickens? Fantastic. Your eggs are incredibly local. Can’t own chickens but want local, free-range eggs? Go to the farmer’s market. Want eggs, because eggs are awesome, but don’t have a huge egg budget? Buy your eggs at the grocery store having the best egg sale that week. Don’t worry about how everyone else is procuring their eggs. Worry about you. In closing, here are two stories from the past week that show the extremes of my own food philosophy. One night, as the boys slept and my husband worked the night shift, I stayed up way too late with a peck of peaches. 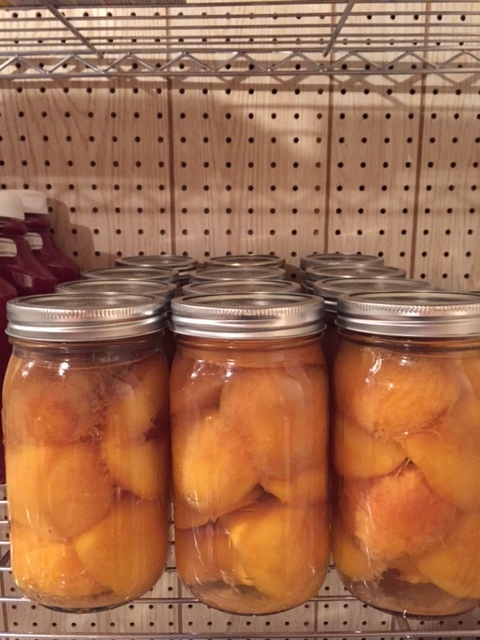 Canning peaches isn’t incredibly difficult. It is, however, time consuming. The reason being is that you need to take very small batches of peaches and drop them into boiling water for about a minute. Then you submerge them in ice water to stop the cooking process. Once you’ve done this, you can more easily peel off the fuzzy peach skin. When you have a big ol’ box of peaches, the boil/ice bath/peel process can take a very, very long time. After this, you stuff them in jars and put them in a hot water bath for thirty minutes. I could only fit three jars at a time in my stock pot, and all total I canned twelve jars, so… math it. Long time. But as I peeled, I prayed for my people. I thought about opening the jars on cold mornings and adding the sweet summer fruit to oatmeal. I watched Gilmore Girls (a lot of Gilmore Girls) and relished the fact that I was alone, in charge only of myself (and a lot of fruit). And in the end, I was tired, but I was proud. We’ve had Froggy for almost three years and he’s never had a birthday before, so this was a big deal. After church that morning, we went to Walmart and picked out a pre-made, sugar filled cake, some candles, and a present for “Froggy” that has become a part of my child’s board game collection. 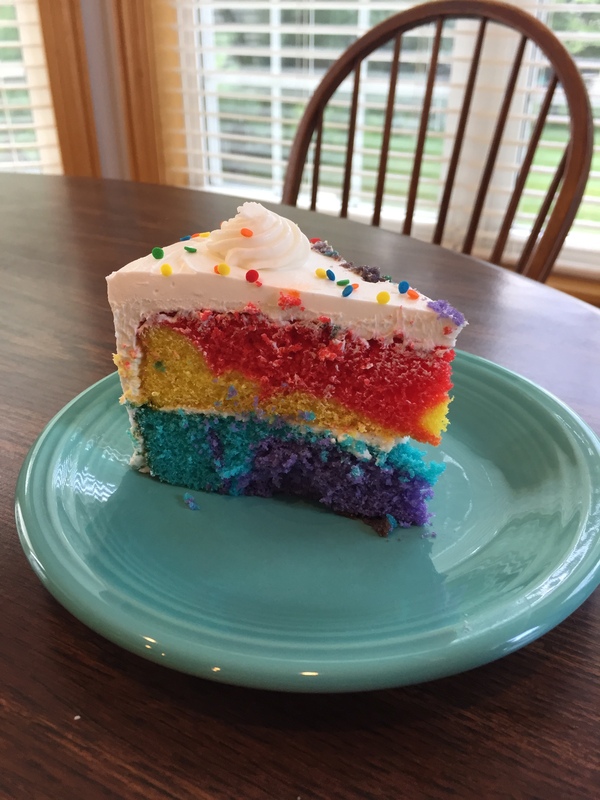 While unconfirmed, I do believe there might be some sort of artificial coloring in this cake. While I know I could have found a way to make a cake that was sweetened naturally with honey or maple syrup, colored naturally with beet juice or turmeric, and filled with whole wheat flour and applesauce or bananas, I didn’t. 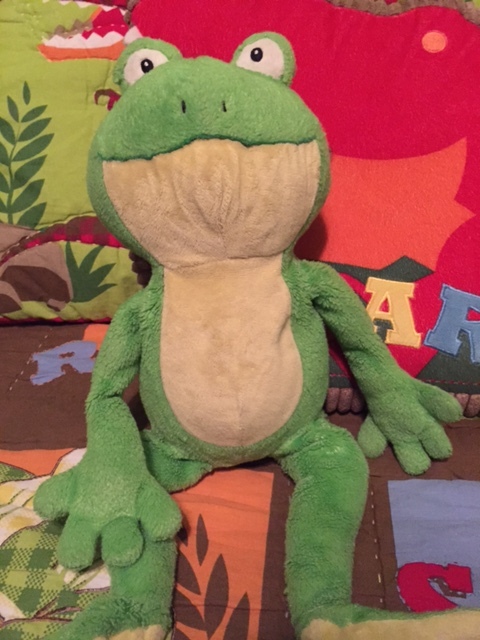 This was a spontaneous stuffed frog birthday party, and they don’t happen everyday (and I’ve had several talks with my young man to this effect). After this cake and party, I wasn’t tired, I wasn’t feeling particularly healthy, but I was still happy. And so there is my food philosophy – a special union of old and new, of homemade and store-bought. Find the balance, find the philosophy that works for you and yours, and embrace it. How do you decide what to buy, what to eat? How does it reflect you? OK J – love your blog! First, Grandma Boone canned peaches when I was a kid. As she got older, she decided store bought would work for her! And I appreciate your boil/ice prep – I do that when I am freezing my own stewed tomatoes – what a mess! Not doing that this year, because my tomato plants haven’t produced much (with the exception of my cherry tomatoes and those I eat as fast as I can. OK – so how do I buy? I like to grow my own (look for red cabbage at Thanksgiving, from my own garden). I have pickled green beans this year – need to do another batch soon. I’m a big coupon/sale person, try to incorporate those in my menu planning. I have decided that Hamburger Helper isn’t really for me – I can make similar things myself (my Mother would be proud of me! ).